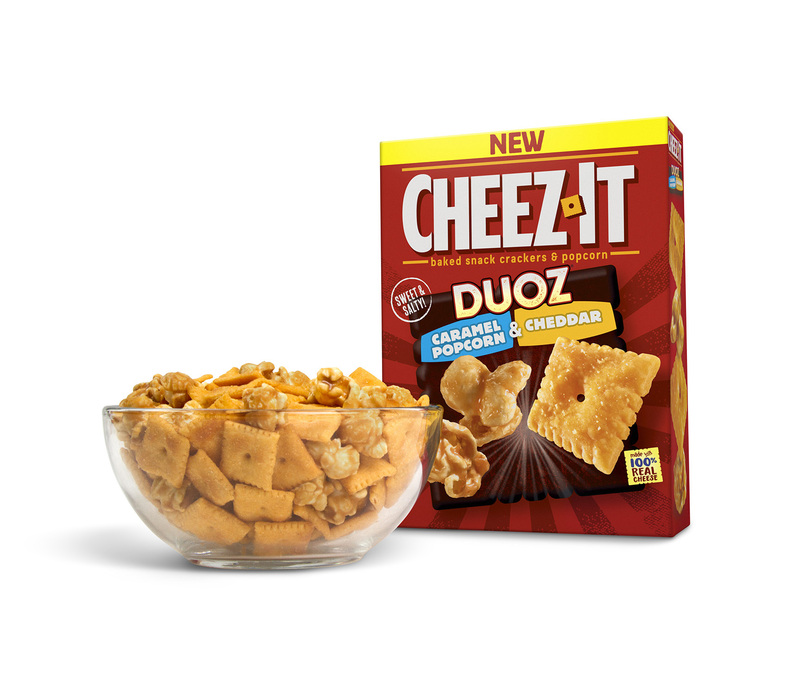 Battle Creek, Mich., Feb. 15, 2018 – Cheez-It® is introducing two exciting cheese snacks: Cheez-It® Duoz® caramel popcorn and Cheddar Crackers and Cheez-It® Duoz® Cheddar Jack Crackers and sharp cheddar pretzel. The new pairings deliver a mash-up of 100 percent real cheese flavor and textures, creating a satisfying snacking experience that changes with every bite. 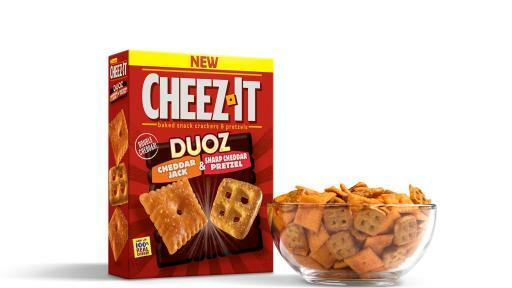 The new Cheez-It Duoz are available at retailers nationwide. 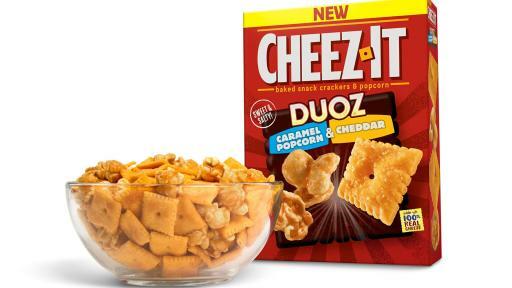 Cheez-It Duoz caramel popcorn and Cheddar Cracker balances sweet and salty flavors as caramel popcorn is paired with Cheez-It Cheddar crackers. Cheez-It Duoz Cheddar Jack Cracker and sharp cheddar pretzel delivers double the cheese flavor with Cheez-It Cheddar Jack crackers and sharp cheddar pretzels. 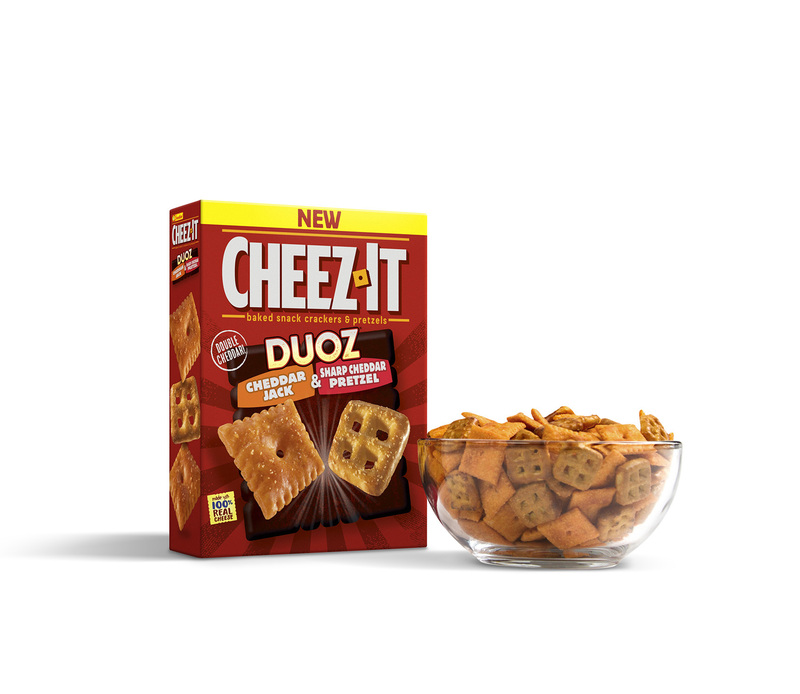 Enjoy the unique flavor and texture combination of the new Cheez-It Duoz varieties while you’re on-the-go, watching movies at home or looking for a cheesy snack at work. 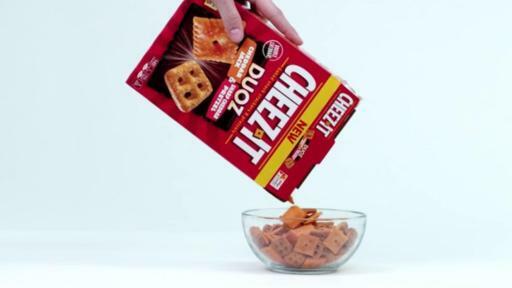 Find out more about Cheez-It Duoz caramel popcorn and Cheddar Cracker and Cheez-It Duoz Cheddar Jack Cracker and sharp cheddar pretzel by visiting CheezIt.com or following @CheezIt on Twitter and Facebook. At Kellogg Company (NYSE: K), we strive to make foods people love. This includes our beloved brands – Kellogg's®, Keebler®, Special K®, Pringles®, Kellogg's Frosted Flakes®, Pop-Tarts®, Kellogg's Corn Flakes®, Rice Krispies®, Cheez-It®, Eggo®, Mini-Wheats® and more – that nourish families so they can flourish and thrive. With 2016 sales of $13 billion and more than 1,600 foods, Kellogg is the world's leading cereal company; second largest producer of crackers and savory snacks; and a leading North American frozen foods company. And we’re a company with a heart and soul, committing to help create 3 billion Better Days by 2025 through our Breakfasts for Better Days global purpose platform. 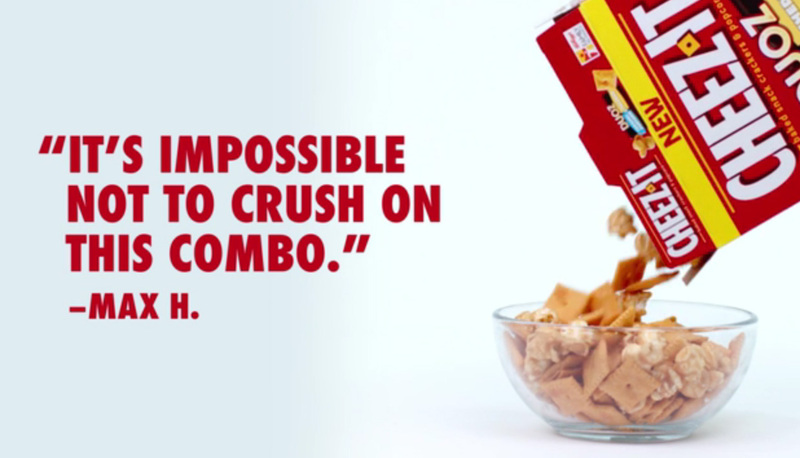 To learn more, visit www.KelloggCompany.com or www.OpenforBreakfast.com and follow us on Twitter @KelloggCompany, YouTube and on our Social K corporate blog.